Washington Broadcast Set for "Torturing Democracy"
Reviewers rate new documentary "compelling," "impressive," "top-shelf"
Guantanamo interrogation draft picked by Slate.com as "Hot Document"
"PBS Slow to Embrace a Program on Torture"
"Did PBS Bury an Expose on Torture?" Washington, D.C., 17 October 2008 – The new documentary film on the Bush administration’s interrogation and detention policies, Torturing Democracy, will air on Washington D.C.’s WETA-TV tonight at 10 p.m. Produced and written by eight-time Emmy winner and National Security Archive fellow Sherry Jones, the documentary has drawn major online buzz as well as New York Times coverage of PBS’s failure to find a national scheduling spot for the film before President Bush leaves office in January 2009. Slate.com selected a key revelation in the film as the Slate “Hot Document” this week – a previously unpublished December 2002 draft of “standard operating procedure” at Guantanamo which shows that interrogators there adopted their techniques directly from the survival training (Survival Evasion Resistance Escape or SERE) given to American troops so they could resist the worst of Communist gulag treatment. 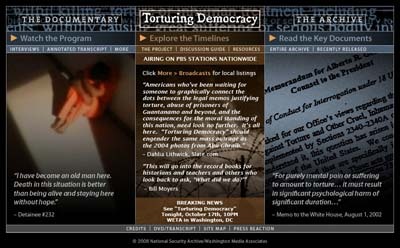 The companion Web site for the film, www.torturingdemocracy.org, features key documents, a detailed timeline, the full annotated transcript of the show, and lengthy transcripts of major interviews carried out for the film. Hosted by the National Security Archive at George Washington University, the Web site will ultimately include a complete “Torture Archive” of primary sources. Watch clips of the movie below, or stream the entire film at torturingdemocracy.org.